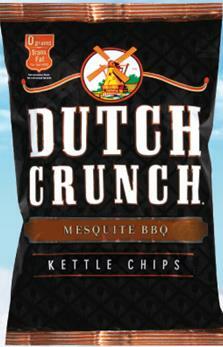 With their smokey bar-b-que flavor and extra crunch. With its smoky barbecue flavor and crunch, a bag of Dutch Crunch Mesquite BBQ Kettle Chips makes any occasion worth reminiscing about – from your next family picnic to afternoon snack. Ingredients: Potatoes, Vegetable Oil (Sunflower and/or Canola Oil), Salt, Corn Maltodextrin, Contains 2% or less of: Fructose, Dextrose, Torula Yeast, Onion Powder, Spice and Spice Extracts, Tomato Powder, Natural Flavors (Including Smoke), Garlic Powder, Molasses, Citric Acid, Yeast Extract, Caramel (color), Paprika Extract (color), Sulfites.